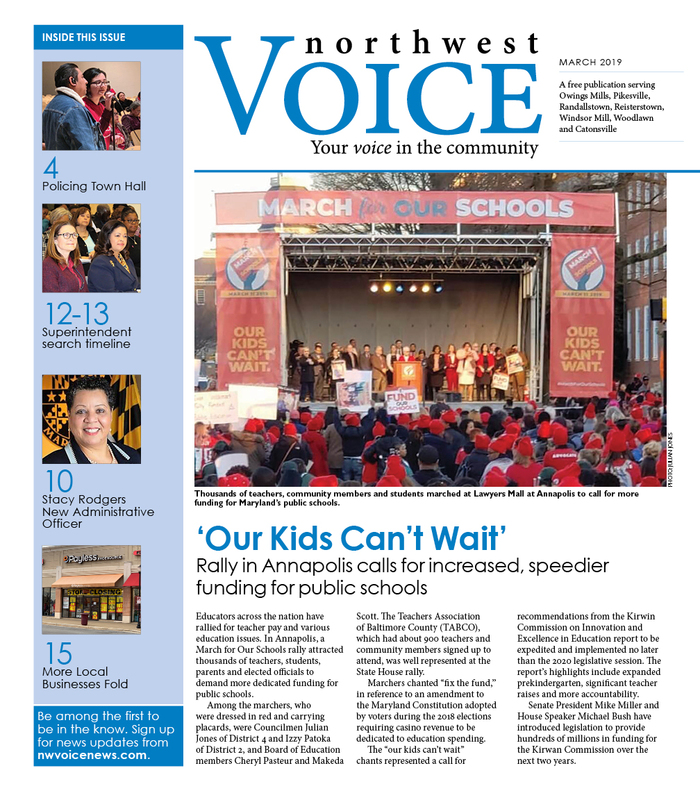 The Primary Election for U.S. Senate was hotly contested and as we know, Rep. Chris Van Hollen defeated Rep. Donna Edwards for the Democratic nomination In the March issue of the Northwest Voice, we interviewed both candidates and shared their stories. After we put the newspaper to bed, I decided to support the Edwards campaign. I must also disclose that managing the campaigns of two elected officials in District 10 and District 44B, I continue to work closely with them. Still, I have my opinions. We are following up on the election story because it is important that the community understand the positive and commendable role they played in the Senate race. When I was working the polls on Early Voting and Election Day I told voters how important it is to have someone at the table who looks like me. I was challenged this thought and told that the election should not be about race. I stand firmly on this notion that race does indeed play a role in elections. If you followed Edwards’ and Van Hollen’s campaigns, you know that race was a key strategy of both their campaigns. Recognizing the value of diversity and the black vote, Donna Edwards rightly communicated that she would be the first African-American Senator from Maryland and only the second black woman Senator in U.S. history. Chris Van Hollen touted his endorsements from black elected officials and from black women. So, let’s not kid ourselves. Yes, you should vote for the person who you believe would best represent your interests. Don’t tell me that we should be above race when others have no qualms about it. Both candidates were experienced and qualified, so let’s not use as an excuse that one was better than the other. So why did all of our elected officials, with the exception of one, choose not to support Edwards? Why do they talk the “we need more blacks in political office, in leadership positions and on corporate boards” talk and not walk the walk? All of the African-American Senators and Delegates—both male and female— in Districts 10 and 44B either endorsed Van Hollen or chose to sit on the sidelines (what a cop-out!) and not openly support either candidate. What is it that they don’t get? The County Executive and County Council members in District 1, 2 and 4, who represent communities in the northwest, also enthusiastically endorsed Van Hollen. I believe in representative government, that we need to be at the table if we’re truly going to be represented. If you take a look at the numbers (see the poll results), particularly in precincts located in District 10, 11 and 44B, they show that voters in predominately African-African communities supported Donna Edwards in spite of the black politicians in those communities who tried to convince people that it was not Edwards’ time and Van Hollen should succeed the retiring Senator Mikulski. Not surprisingly, the precincts with primarily white voters supported Van Hollen. Precincts in District 10 polls in Randallstown, Owings Mills and Reisterstown supported Edwards by 58 percent to Van Hollen’s 42 percent, and in District 44B she won in the Windsor Mill, Woodlawn and Catonsville precincts 60 percent to 40 percent. It was the opposite in District 11, where Van Hollen won 31 percent to 69 percent in the precincts located in Pikesville and Owings Mills. How did our elected officials get it so wrong? How do we get a black Senator elected with this attitude? Those same elected officials owe their positions in office to the votes of African Americans. But when an historic election such as the 2016 Primary comes along, and we had an opportunity to put an African-American woman in the U.S. Senate, the community got it and understood the importance. The elected officials did not. That tells me that I say our representatives are out of touch and out of sync with those who put them in office. I can’t tell you how very proud of our community leaders and members who took a stand. Despite the decisions and actions of our elected officials and leadership in the Democratic Party, the community voted for the candidate they believed would best represent them in the Senate. Is it a coincidence that a black hasn’t been elected to a statewide office in the 250-year history of Maryland? When I look at the Senate, which has 100 members and only two people who look like me and no African-American females. Why is that important? Different people bring different perspectives to the table. Eighty percent of the people making the decisions are white males. I like Chris Van Hollen, but his demographic is well represented already. Did black officials not understand the significance of electing a black Senator or did they understand and not want to elect Edwards? It is so disappointing that they did not want to give Edwards the opportunity to serve and to inspire the next generation to follow her footsteps and do great things. The sad part is many of these politicians who chose not to support Edwards’ candidacy are intimately familiar with the struggle in the ‘50s and ‘60s for civil rights, racial and gender equality and rights for the middle class. I want to remind everyone that the Legislative District 10 and Councilmanic District 4 did not exist because an African American could not collect enough votes to get elected in Baltimore. So they created a minority district. The same people who benefitted from this chose not to support the black senatorial candidate. I, and many African Americans have been voting for whites all of our lives. That is not the case with a lot of whites. Inside the Democratic Party, they seem to be fine with the idea of blacks representing black communities, but we never see them passionate about supporting a black that represents the general population as a whole. I didn’t seem the same enthusiasm and hard work for Anthony Brown for Governor that you saw for Van Hollen for Senate. Brown couldn’t win statewide but he goes back to his Prince George’s County and gets elected to the Congress. In case you’re wondering: Yes, I congratulated Van Hollen. But if I had to do it again, even knowing the outcome, I would still support Edwards’ campaign for the middle class and working families. We move forward. We learn. We will remember. To the elected officials, the community is watching you. We saw what you did. And we are not going to pretend that it’s OK. Represent your constituents. Represent the community you were elected to serve. Those are my opinions. Tell me what you think. Leave a comment below.